Come on Vaminos!!! Everybody let's go find the Ultimate Dora Theme Birthday Party Ideas! Don't worry, we're not going far, just to the Spooky Forest!!! And if you see Swiper...what should you say? Don't worry if you don't know, because that is included in the party information below. Now let's get going and start with the party location. I'll see you again after you have planned your party and are finishing up with the Thank You notes. Have Fun! But before we get started, take a look at this great party pack. 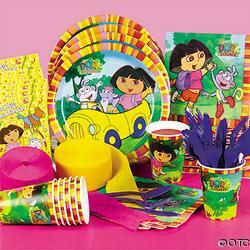 It includes just about everything for a Dora the Explorer Theme Birthday Party. * Spooky Forest: Now I bet you are wondering where there is a spooky forest around your house and how do you rent it out for birthdays. Well, I have the answer to all of your questions. First, you are going to have this wonderful party in your home...and of course that means a little transformation needs to happen. Now don't get discouraged, you are going to find a ton of ideas on this page on how you can turn your home into a "Spooky Forest". To get started, I would suggest checking out our selection of Clip Art and Coloring Pages. You will find so much information you won't be able to use it all!!! Now what are the benefits of having a party at your home? You might be thinking NO WAY!!! But wait, first I know you won’t forget any crucial party items at your home (e.g. piñata bat). Second, that reservation won’t get screwed up…because you are already there! Finally, you know where everything is, how convenient. Now don’t get me wrong, you do run the risk of damage and such, but weigh the benefits and risks and pick what’s best for you! * Crocodile Lake: WOW, what an idea for a party...a bunch of kids and some crocodiles...that just doesn't seem right. Well, again I am talking about an imaginary Crocodile Lake. Please don't only read the title and invite 10-15 kids to a local crocodile lake. I don't think you, your child or the guests will have much fun. But how about transforming a park into a Crocodile Lake? First, make a list of all the local parks in the area and write down the key features of each one. For example, how much area is available? is there a playground? trash can availability? Bathrooms? covered areas? Capacity of park? etc. You don’t want to show up at an overcrowded park, with no playground, no bathrooms and it start to rain. Spend some time in selecting the right park and I guarantee your party will run a lot smoother. Finally, get there a little early and setup your decorations to turn that park into a crocodile infested lake!!! * Dora's Day Out: Want to take Dora and your child out on the town? How about renting an establishment to have the party? A lot of locations will provide you with invitations, discounts on food, a cake, etc. Make sure you find a decent place that provides you with enough stuff to balance out the cost. Don’t be afraid to ask for food discounts and other items, you will be surprised on what they will offer, but only if you ask! * Invitation Help: As you start to create this invitation masterpiece, don't forget to check out the Dora clip art for lots of different pictures. They will help you design the inside and out. Good Luck! 2. "Join us for a birthday Fiesta with Dora and child's name!" * Dora Invitation #1: The main card can be purple with a raised design (you can find lots of neat paper from a scrapbooking store). Next purchase vellum and use a computer to print 'It's a Fiesta' and the Backpack character in black and fasten it to the purple card with brads. On the inside, paste a piece of paper on the front and a piece of paper on the back - the first one will have a picture of Dora and the other has all the party details. * Dora Invitation #2: Here is an awesome map invitation. Start by getting some ivory, tan lined paper that looks like map material. Use a computer to generate the map. Print the map right on the front of the paper. Next, print your party details somewhere on the map. Finally, fold the map like a real map would be folded and send off to the guests. * Dora Invitation #3: Start by making a purple backpack invitation card. In the side pocket of the backpack put a yellow Map, which contains a HOLA invitation greeting from Dora and a path ending at your house. Draw 3 items on the invitation just like Dora's adventure. The first stop could be a picture of a cake with your child's age on it, the second could be a calendar month of the party with the date highlighted and the third could be a picture of a house with your address written on it. Roll the Map up and draw eyes, eyebrows and a mouth on the top and insert it into the side pocket of the backpack. We can't have a birthday without a birthday cake!! to (child's name) birthday cake box? To Celebrate (child's name) (age) birthday! This Dora Hideaway will be the center of attention during the party. Kids love forts and they will definitely love this! Use sidewalk chalk to draw the Dora the Explorer logo on the driveway. Put stars on the sides leading up to the party entrance. Do you have a large refrigerator box you could get your hands on? You could easily transform that plain cardboard box into Dora's Casa. How? Simple. Start by cutting out the windows and door. Next, paint or color the house. Finally, place the house either in the forest or in the middle of the party area whether inside or out. Don't forget to check out our clip art section for a picture of her Casa. Want to bring the spooky forest to life? Start by cutting green streamers and hanging them from the ceiling. Cut out animals and paste them to the walls and hang them from the ceiling. Also, some trees and shrubs would be great. Play some spooky music in the background while the children are in the "forest". Also, if you have a fog machine, this would be an excellent effect to bring the forest to life. Get this Tiger and Zebra patterned Gossamer. It is a great deal considering all the things you could decorate with it. Another great idea is to print out some great pictures from our Dora Clip Art Page. Have them laminated and place them around the party area. Here is a great Dora Happy Birthday Banner for the party. How about playing the Dora the Explorer theme song while the children are arriving? Don't forget to put a map poster on the wall and have star cutouts on all the tables in the party area. The colors of the party should be pretty simple. I would stick with blue, pink, yellow or green. After you have selected the party theme colors, decide on whether you will use either printed or solid color party tableware. 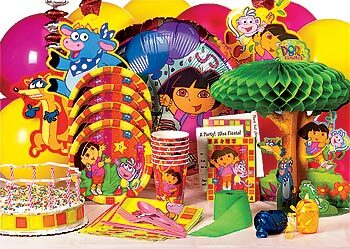 Now that you have picked out the location, selected a few decorations and picked the theme colors and party tableware, what is your child going to wear to the Dora Theme Birthday Party? Wouldn’t your child love to dress up as Dora? I know they would, so here is a perfect chance to let them. Check out these Ultimate costumes!! First, check out these great Face Paint Crayons. You can decorate the children however you want!!! 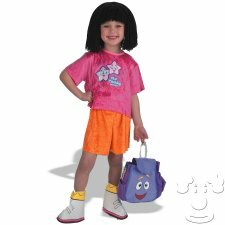 Here are 2 great Dora Costumes for your child to wear at their Ultimate Theme Birthday Party. Just click on the image to view. A simple game of Dora, Dora, Explorer (i.e. duck, duck, goose) is a great ice breaker activity. You can keep adding children to the circle after they arrive. I have yet to find a child who doesn't like this game, it’s a classic!!! Freeze Dance is another great game to get kids acquainted. The game doesn't require a certain number of kids, so they can join in as they arrive. Play the Dora the Explorer soundtrack as the kids dance. If you stop the music, they must freeze. If they don’t freeze, they are out. The game restarts after all the children have been eliminated except one. Kids love to dance and play games, which makes this an Ultimate Ice Breaker Activity. Deciding on whether you are going to make or buy the Ultimate cake is a tough decision. It mainly depends on how much time you have and how many guests are coming. I would suggest for a smaller party, you try and make that Ultimate cake. But if there is going to be a large number of guests, maybe a large cake made by the baker would be the best decision. 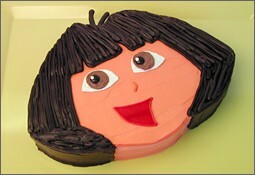 It’s up to you, but here are some ideas on making an Ultimate Dora the Explorer cake. 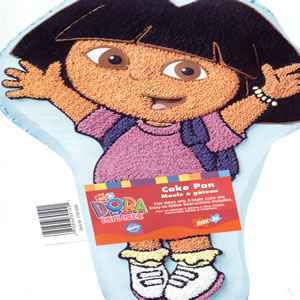 Click here for the Ultimate selection of Dora the Explorer Toys. Need something besides a Cinderella toy? Click here for the Ultimate Child Birthday Parties toys. Looking for the Ultimate Dora Games and Activities? Great, I have dedicated a whole page for these games. I know you will find enough choices to fill the games section of your Ultimate Dora the Explorer Party. 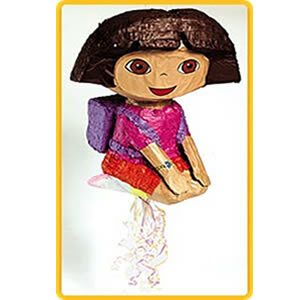 Do these piñata not quite fit your Dora Theme Birthday Party? 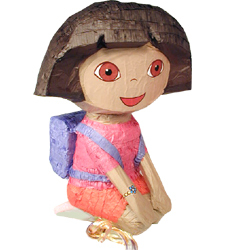 Click here for the Ultimate selection of birthday piñatas. Now it’s time for the Ultimate Dora Kid Birthday Parties games. Check them out here. Now the parties over, what do you do? Start planning the next one? Sure, but you don’t want to forget about the guests that helped you celebrate your child’s birthday. Make sure to send out some type of Thank You note. Whether it is store bought or hand made, just make sure to get it out no later than a week after the party. Also, if you took any pictures at the party, make sure to include one in each invitation. Any Thank You note you choose will end any Ultimate Dora the Explorer Theme Birthday Party.